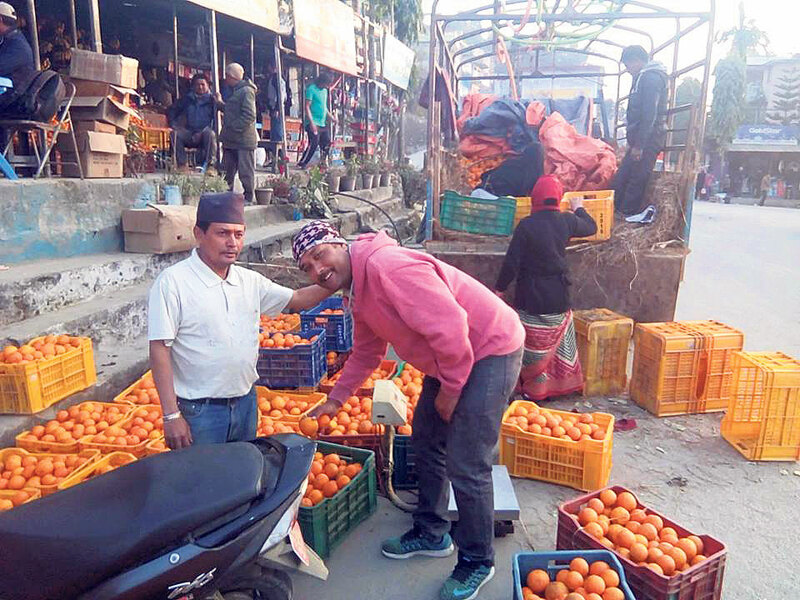 BANEPA, July 12: Green pest management treatment method introduced from China has been found effective in controlling Chinese citrus flies that have been destroying Junar -- a variety of sweet orange -- in Sindhuli among other parts of the country. The method was introduced in Nepal by Dev Raj Adhikari of the Sweet Orange Super-zone Unit under the Prime Minister Agriculture Modernization Project and Karma Group -- an importer of fertilizers. The method was developed by Beijing Ecoman Biotech Company Limited. “Farmers have been spraying Great Fruit Fly Bait (GFFB) on the underside of the leaves. As female citrus flies need protein to lay eggs, the GFFB pesticide mixed with protein kills citrus flies. This method has worked wonders for Junar farmers of Sindhuli,” Adhikari, who is also a senior crop protection officer, told Republica. Technicians have divided 800 ropani of land (5,476 sq ft) in Golanjor Rural Municipality of Sindhuli, where Junar is cultivated, into 10 clusters and spraying Great Fruit Fly Bait on the underside of Junar leaves every week for the past nine weeks. “We will wrap up the treatment process with the final spray by mid-July,” Lalan Kumar Singh, chief of the super zone unit, said. A solution of one-third of GFFB and two-thirds of water has to be prepared, the technicians added. A solution of 50 ml will be required to spray one square meter of area, according to Lok Bahadur Ale, deputy coordinator of the super zone management unit. “We are employing 10 workers to spray the solution on Junar leaves,” he added. Ale, who was disappointed with low yields last year, is upbeat about better harvest prospects this season. “We have seen the citrus flies dying. As the super zone has introduced treatment methodology at the right time, we are expecting better yields this year,” stated Ale. Suresh Gurung, CEO of Karma Group which introduced the treatment method, told Republica that the pesticide could be imported to Nepal only after representatives of Ecoman were convinced by Adhikari. “The success of this method in Nepal has also elated officials of the company. They are visiting Sindhuli very soon to interact with farmers,” he added. The Chinese citrus flies, which are native of China, made its way to eastern hills of Nepal via Bhutan and Sikkim of India. It invested Junar farm of Sindhuli last year, causing huge loss to farmers. It has since spread across Kavre and Sindhupalchowk districts.